The Browser is a tab displayed within the Experiment Explorer Window. 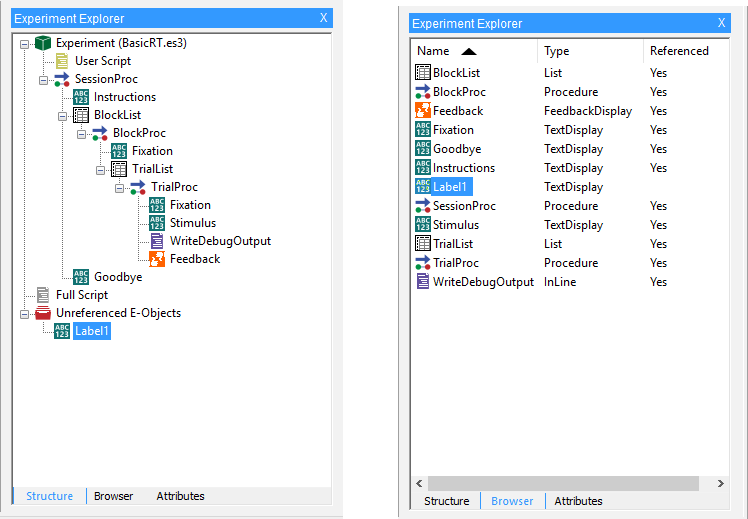 The Broswer tab displays the objects currently instantiated in the experiment in a report view format. The report lists the name of the object, its type, and whether or not it is currently referenced. The objects listed are not necessarily used in the experiment, but they exist and are available for use. For example, an object that has been deleted from all Procedures, but not from the experiment, would appear in the Unreferenced E-Objects folder in the Structure view, and would be listed in the Browser. The value for the Referenced column in the Browser window would remain blank. The objects listed in the Browser can be sorted by Name, Type, or Referenced status by clicking on the column header. Subsequent clicks on the header reverse the order of the sorting (e.g., A to Z, Z to A). Deleting an object from the Browser results in all references to the object being removed from the experiment. Once deleted from the Browser, the object is not retrievable, and must be recreated if needed. A delete operation within the Browser requires confirmation from the user before it is performed. The Browser supports the dragging of objects from the Browser to Procedures within the experiment. To copy an Object, a Procedure needs to be opened in the Workspace. By default, a simple drag creates a new “reference” to the selected object, but a Ctrl key can be applied, as a mouse modifier, to indicate that a copy of the current item should be made. Specifically, Ctrl+Copy is often used to duplicate an object (e.g., to create a Procedure with the same sequence of events, but which calls a different List object). Likewise, cut, copy and paste options are available via the context menu, which can be accessed by right clicking on any object within the Browser.